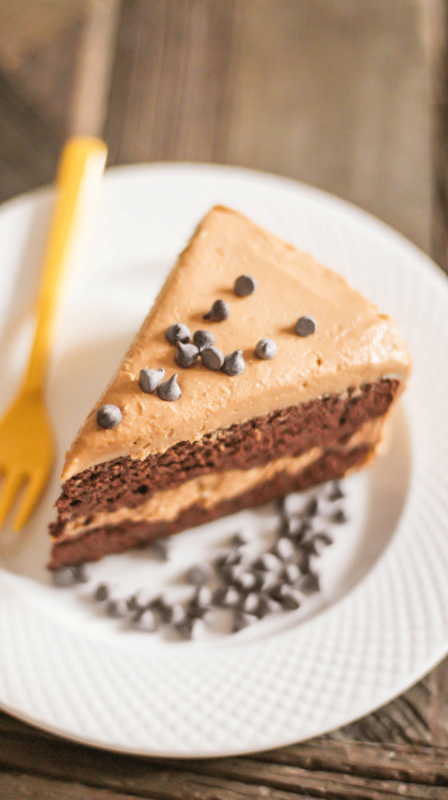 Healthy Chocolate Cake with Peanut Butter Frosting — the cake is super moist and chocolatey, the frosting is incredibly rich and sweet and PACKED with peanut butter flavor… you’d never know the slice in front of you is sugar free, low carb, high protein, gluten free, dairy free, and keto-friendly too! I was in the mood for Chocolate Cake, but I was also kinda in the mood for peanut butter… just like every other day. 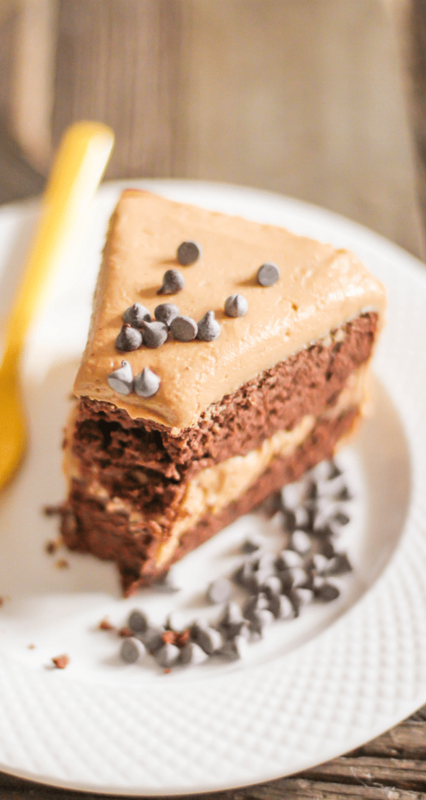 So I made a healthy Chocolate Cake with Peanut Butter Frosting. And it’s the bomb. But this isn’t just like any other Chocolate Cake, this is a HEALTHY Chocolate Cake! It’s super chocolatey, moist and decadent, just like the storebought mixes. And the frosting? OH MY GOODNESS GRACIOUS. It’s heaven. Wait no, it’s not “like” heaven, it IS heaven. And that’s a fact. I’ll let you in on a little secret here too: When I was about to make the peanut butter frosting, I remembered I had run out of peanut butter the day before (crying and screaming occurred here, obviously). And then I remembered my Peanut Butter Frosting made without peanut butter. Peanut flour literally saved my life this cake. Peanut flour is like peanut butter in powder form. You can use it in baked goods and frostings, you can even reconstitute it with water or milk to make “instant peanut butter.” I use peanut flour quite often in my recipes and even used it in my cookbook, DIY Protein Bars, too! If you haven’t tried it, I highly recommend it. Can I tell you another secret? I ate this cake for breakfast. Like, three days in a row. And I’m pretty sure those three days were the best days of my life. Imagine this in your face: Healthy. Chocolate. Cake. With Peanut Butter Frosting. Sounds great, doesn’t it? Yes, of course. Because it is, duh. 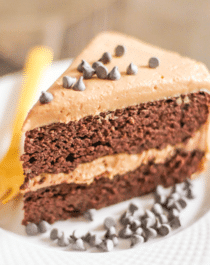 This Chocolate Cake is super moist and chocolatey and the Peanut Butter Frosting is incredibly rich and sweet and PACKED with peanut butter flavor. You'd never know it's sugar free, low carb, high protein, gluten free, and dairy free too! In a medium-sized bowl, whisk together the coconut flour, erythritol, cocoa powder, baking powder, baking soda and salt. In an electric stand mixer bowl fitted with a beater attachment, add the applesauce, almond milk, eggs, egg whites, vanilla extract and stevia extract. Mix on low speed. Add the dry ingredients to the stand mixer and increase the mixer speed to medium. Mix until the ingredients are fully incorporated. Scrape down the sides of the bowl if necessary. Pour the batter into the prepared cake pans. Tap the pans on the counter a few times to make sure the batter is level. Bake for 50 minutes, or until the surface springs back when tapped. Let cool completely in the pan. TO FROST- Flip one cake layer onto a cake pedestal, peel off the parchment paper cake liner, and frost with your frosting of choice. Flip the other cake layer onto a parchment paper-lined cookie sheet, peel off the parchment paper cake liner, then carefully slide it onto the frosted bottom cake layer (this is a delicate cake, so be careful!). Frost the remainder of the cake. Slice and serve, or store in the fridge covered with a cake dome for up to 5 days. This recipe was republished with permission from the Naughty or Nice Cookbook. 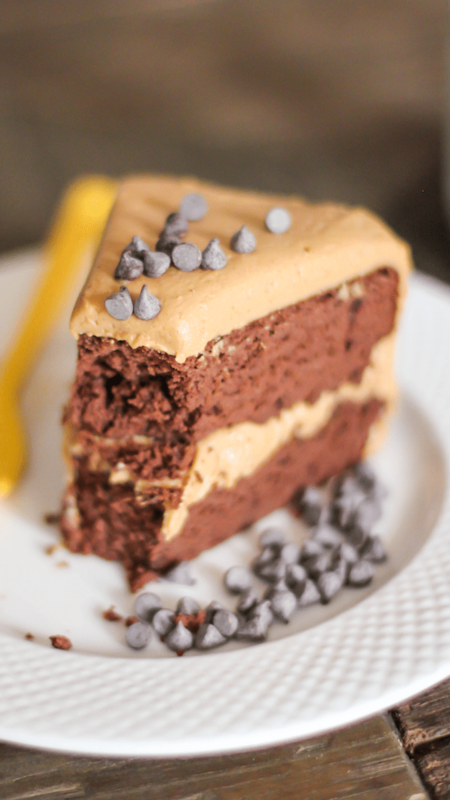 Chocolate Cake (pages 88-89) and Peanut Butter Frosting (page 155). But hold up – CHECK OUT THAT HOTTIE!! Loving the new picture! Pinning! This looks to die for – as always! I’m really intrigued by the look-alike Pay Days! I love anything chocolate mint. So of course, I would make the choco-mint bars, yum! The peanut flour in the icing is really cool… dying to try it out! mmmm yum! I love peanut flour, it is so versatile! Fudge! Also I’m already an email subscriber, and don’t have social media (work restricted). I love peanut flour! Love the idea of peanut butter frosting! I could think of a bunch of things to put it on! I want to make the PB&J protein bars! Why do you have to cover it and leave it overnight? Oh I’d definitely make any chocolate flavor bar no matter what! Ill be making this peanut butter frosting vegan style for sure! Healthy chocolate cake? This is my kind of recipe! I never have seen peanut flour before – so thanks for drawing my attention to it, I have to get my hands on some! PB & Chocolate is a match made in heaven! The red velvet ones look delicious! Definitely the peanut butter fudge (basically, you had me at fudge.) Yum. Can we substitute another vegetable puree for the pumpkin? wow, I never knew you could do that with peanut flour! awesome! Yum! My favourite combination! I have to try this! This cake looks great, looks very moist and light too! And oh peanut “butter” frosting, my very favorite. I’m also a huge fan of peanut flour, it is really the best thing ever! Chocolate peanut butter is my favorite combo!!! Love this recipe! Perfect for birthdays! I would so make the s’mores bar.. I just love anything s’mores! Anything with peanut butter in it looks good! This looks to die for.Is ther a reason you’ve started to use whole milk again and whole eggs, rather than egg whites alone? Just curious! I don’t have any stevia left…do you think I could increase the sugar by about 1/2 cup and just reduce the milk or something? Would that work? Love this site so much! Thank you for your awesome recipes!!! My parents have issues with their cholesterol, and I did too when I was younger, but now that I eat healthier my cholesterol levels have dropped and I can afford it with milk, cheese, bacon, etc. I use whole eggs in recipes with coconut flour because coconut flour bakes up super crumbly without them. The stevia will be difficult to replace… 1 tsp has the sweetness of ~1 cup of sugar. If you’re using the organic stevia mix/Truvia, you’ll need to increase it to ~1 cup total. If you’re using a sweetener that’s cup-for-cup as sweet as sugar, you’ll probably need ~2 cups. I hope this substitution works out for you! This looks great. I will try it out if i can find peanut powder. Last night I baked the chocolate cake with peanut butter frosting for my boyfriend’s birthday. The cake tasted absolutely incredible! My boyfriend loved it and said it was the best cake he ever had. Thank you so much for your healthy dessert recipes that also taste amazing. I plan on making this for my hubby for Father’s Day (he loves Choc/PB combo). Can I use Swerve for the Organic Stevia Mix, and if so how much would I use ? Thanks so much ! Love your website, it’s a lifesaver ! You can use Swerve in place of the Stevia Mix, but you’ll need to use ~1 cup. I hope you both like/love the cake!! Ugh, so this didn’t work out so well for me. I used swerve instead of stevia mix and applesauce instead of pumpkin. Those were the only differences. The texture was a bit grainy; this is the first time I’ve baked with coconut flour so maybe that’s normal ? But it completely stuck to the pan and crumbled when I tried to get it out. I used parchment paper sprayed with a generous amount of non stick spray. I did manage to finally get (most) of it out and assemble it, but it looks like a hot mess, LOL. I’m not sure what I did wrong. I make wedding cakes for a living and I’ve never had this much trouble having a cake crumble or getting it out of the pan. Please help ! I really want to embrace the low carb, healthy sweets…. (this is my first low carb cake). Thanks ! I feel like the cake is pretty much the same the day you make it and the day after… if anything, it just slices a little better and cleaner. Since the frosting contains peanut flour (an ingredient that basically acts like a sponge and absorbs a ton a liquid), it’s best to frost the cake the day you serve it.